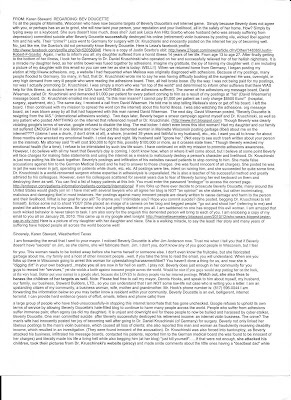 Click on letters to enlarge! 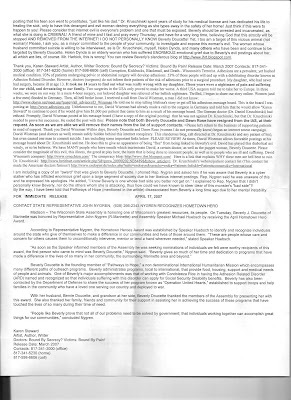 Copy of a letter placed in mail boxes in Marinette City Hall on Tuesday, January 4th, 2011 by Mayor Robert Harbik after receiving it from Karen Stewart of Weatherford, Texas. Based on this letter from Karen to Bob, it appears that they have been in communication for some time now and have kept it a secret! It's out now because Bob thought it would dish Bev Doucette with the contents, instead, the letter only served to confirm that Karen Stewart is still seething and spewing a whole lot of bile after being shut down well over 4 years ago by an International group after being caught harvesting patients to a Con Doc in Germany! And for Harbik, it shows a most tastless, unproffesional slug of a man stoooping to such low level antics in his attempt at trying to make Bev Doucette look bad! My, my, birds of a feather, do seem to flock together! Is she mad, of course she is, you would be too if you were caught doing what she did, which appears to be nothing less the "Human Trafficking!" We invite you to read this letter as it is among some of the best material written that will show the psychological workings of a lady laid waste by her own self tormenting! While she was praying, fasting and seething with hatred, the rest of the world simply moved on, so not only was she still seething, she was eating every one else's dust as well! In fact, until this letter appeared, Karen was virtually forgotten. The IHRT Blog Team says, " Welcome Back Karen," and we also welcome your friend, "Bob Harbik" to the pages of IHRT! The best of all was that Karen, in her attempts to hack into the blogs, disclosed that Terry Setunsky is going to run for Marinette Mayor in 2012! Karen Stewart in IHRT Stats..looks like no one took Karen out for New Years! LIke Karen says, on the Internet NOTHING is sacred, or private! Better to watch out who you choose to play with Harbik & Setunsky, as Karen will take you down! Better she's on you two then someone else though!